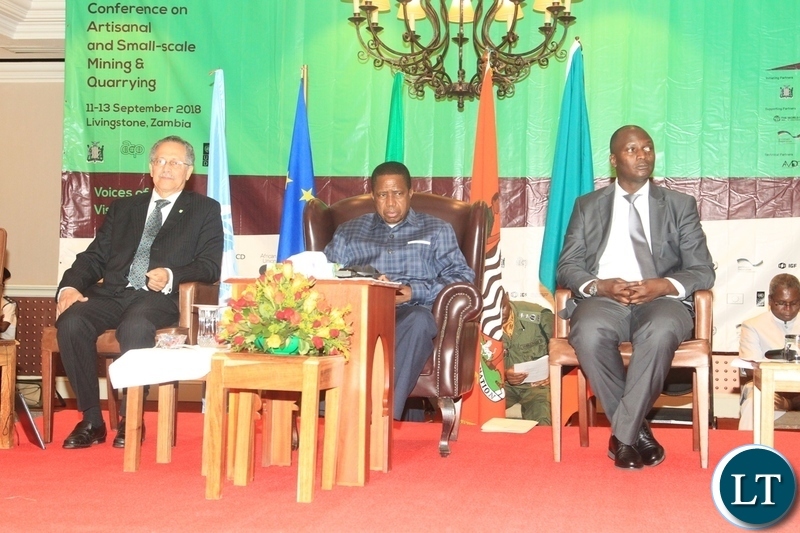 President Edgar Lungu at international conference on small-scale Mining and quarrying in Livingstone. President Edgar Lungu says Artisanal and Small-Scale Mining has great potential to advance integrated and sustainable social economic development. President Lungu however said little attention is paid to low value minerals in which artisanal and small scale miners are involved with more concentration on exploitation of high value mineral through multinational companies. He said the sector is neglected and this is evidenced by lack of clear policies and strategies to harness its potential. “ It is undisputable that mining has been the main stay of the economies in the African Caribbean Pacific (ACP) region but it has not been fully exploited to spur economic development to the level eliminating poverty in the individual countries, “ said the President. The President went on to stress that development strategies at both national and global levels have articulated the need to exploit the potential of Artisanal and Small Scale Mining if the sector is to contribute to sustainable social economic development. The Head of State was speaking in Livingstone yesterday when he officially opened the International Conference on Artisanal and Small-Scale Mining and Quarry management which has attracted over 500 delegates from over 70 countries. The promotion of Artisanal and Small Scale Mining and exploitation of development minerals is one of the strategies aimed at achieving the goal of the Seventh National Development Plan, President Lungu noted. Zambia is one of focus countries of the ACP-European Union Development minerals programme which has formed the basis of designing interventions included in the Seventh National Development Plan. The development of small scale mining calls for formalization of the sector with emphasis on increased production, use of safe and efficient mining methods and environmental protection. “ There is need improve policies on mineral resources, put in place appropriate institutional and regulatory framework in order to utilize them as a catalyst not only for revenue but as a catalyst for the structural transformation of African economies, “ emphasized the Republican President. And speaking earlier, African Caribbean and Pacific Group of States, Secretary General Dr Patrick Gomes said there is need for development of the minerals sector as it contributes significantly towards achieving sustainable development goals (SDGs). And United Nations Resident Coordinator, Janet Rogan said the majority of the small scale miners especially women face many challenges and do not fully benefit from their labour hence the need for formation of cooperatives to enable them access funds from banking institutions. Programme, organised by the African Caribbean and Pacific Group of States, European Union, UNDP, Zambian government with support from World bank. The conference is meant to foster a global dialogue about the development opportunities, best practices and challenges of Artisanal and Small-Scale Mining(ASM)as well as provide opportunities for them to discuss and share their vision of the future. President Edgar Lungu has since returned to Lusaka after touring some exhibition stands of artisanal and mineral products at Avani Victoria Falls Resort. Friends on this forum, I have a question: are we short of event organisers/designers pa Zed? Why is ba Kateka on a ‘stage’ with an after-thought flower on poorly designed furniture? and that tent-like shiny banner at the back? Appearance can be everything! Disgusting! The problem is that Visionless will jump on the next plane out of the country. Thats the difference btwn Lazy Lungu & Magufuli. – Chinese are mining & dealing in copper, manganese without licenses or paying tax bcoz of a collapsed govt. – Senegalese & Indians at Kagem hav been smuggling billions worth of emeralds out of the country for decades without paying taxes yet Lufwanyama is still a rural outpost. Zambia, which is the 3rd largest source of emeralds in the world after Colombia and Brazil. The World’s largest emerald crystal discovered in Zambia Mbuva-Chibolele mine located in Zambia. The emerald which is a 10cm long hexagonal weighs a whopping 10,050 carats equivalent to 2.01 kg. Yet there are no records of taxes paid for this stone. – KCM has been defrauding ZRA over VAT refunds with over-priced imported spares whilsts undervaluing exported cobalt & copper. Today KCM is refusing to pay CEC for electricty, or pay senior managers & threatening to retrench workers in order to arm-twist govt into repaying fraudulent VAT refunds. Wake Lungu, do some real work. Globe-trotting won’t help feeding a child in Kaputa. “Signing a contract with China is like, ascribing to the boiling frog effect; a fable describing a frog being boiled alive slowly. If you drop a frog suddenly into boiling water, it will jump out, but if you put that same frog in a vessel of water and start heating the water gradually, it will adjust its body temperature accordingly until it reaches a stage beyond its capacity and dies foolishly. It’s rather pathetic how China is re-colonizing Africa by appealing to the ignorance and selfish interests of our leaders. Today, the Chinese are offering mouthwatering deals to Africa, both in cash transactions and the outmoded or rather defunct barter trade which seem very attractive on the outlook but dangerous in reality. A shambolic design is what portrays this myopia of a President…the lazy man is utterly visionless, tomorrow he will be reading a speech about how we need to diversify our economy from mining. Zambia deserve better than this lazy man wasting her years away. Has Animo Farm come to fart yet? Of course! “Impemfu” means a cockroach. We cannot develop with roaches. @Voice of reason. That’s a legitimate concern you have, friend. If we fail to organize a simple event properly, I seriously doubt our ability to deal with more serious issues like feeding children in Kaputa. Mr President, mining is a thing of the past. In this era we are focusing only on diversification into agriculture full time. Those small scale miners and Jerabos can hung with their thuggery and stuppidity. You are on the wrong wave length. Lazy bum illiterate little boy may be pooping in pants. He needs a napkin like my baby. You cannot predict when he will have an accident. His polygamist tribal father didn’t do a good job on Gay Jay’s toilet training. He does the worst in public. Lazy bum illiterate hooligan bully son of a tribal polygamist with no manners. You invest to make money little boy. Now, even a grade 7 knows other metals are part of the copper ore and can be extracted during purification….the corrupt theif either knows of this and is benefiting or is ignorant….what a shame…. After little boys have just come from worshiping an illiterate, not a politician god of theirs Under Five, this cannot make sense! Of course, it is not that it doesn’t make sense, “HE IS NOT TONGAA. ONLY A TTONGA CAN BE PRESIDENT,” Larry Mweetwa. Sorry, I may have put a wrong person for that quote. HATRIBES UTD, TRIBALISTS. I was trying to listen to Under Five, he never makes sense and I wondered how people listen to him then I realised he is followed by tribals. UPND is a TRIBAL H-ORGANISATION. Where is Bonehead Mushota this morning? How/why is this news? Can you all report on Amos Chanda’s wealth and how it was accumulated? Anything meaningful really. Move us forward for once. Did you just realize this Mr. President? Better late than never I suppose. What are you doing about it, seeing as you are in charge? Will you now pick up the issue of taxes as has been long talked about, or will you instead tax your citizens for fresh air? Lungu an his corrupt administration should take a leaf from Botswana who with only diamonds changed the lives of citizens for generations to come because of inspired planning and strategy. For Zambia’s abundant mining endowment, the country should be miles gone in development. It cannot happen in Zambia. Botswana & Namibia have serious leaders without Komboni shortsighted mentality! Remember Jonathan siding with mining companies who were instructed to pay Zambian Billions of U.$.D in unpaid Taxes, & mining royalties? Greedy Chawama client cash embezzling Jona interfered after getting a hefty backhander, & urged Zambia to write off & forget about the Billions owed. This myopic ever drunken visionless Ch.ule’, forgets he would have hdd money in Government coffers had the mines paid WHAT’S RIGHTLY OURS, & Ka Chakolwa would NOT have had to jump on a plane to China to sell the country to his master’s. WASTED YEARS UNDER CHIBUKU MAN INDEED!! These are wasted Lungu years…he just travels, issues silly orders and reads speeches..this is just a ceremonial President…useless bum!! HH is a tribal thief, grabbing land, involved in money laundering and taking it to Tax Havens like Panama. He is also a privatization thief and inside trade thief. He should be in Jail. Thank God he is UNELECTABLE. HH should take a leaf to Botswana who with cattle changed the lives of Tswanas even tho’ their livestock had dung. They never allowed it to infest their brains. You dont need £30 million for a face-lift its daylight robbery…its not even a priority when schools lack roofs and toilets. Don’t blame poor event management because someone has hired his wife instead of professionals for justifying modernization of Mulungushi …you can be in a billion dollar conference centre and still mess up…stop this lazy thinking!! These P.F Bonehead Cadres all believe money grows on trees, & don’t understand its true value, & find it hard to conceptualise the value of cash, as they are now used to their Drunken ever inebriated leader “Eagle 1”, sorry “Chakolwa 1” who constantly [email protected] the treasury, & shares out cash meant for development amongst his cheerleaders, & bootlickers who wake up in the morning shouting the P.F. morning prayer, “chakolwa wandi, 2021 Nafuchi nafuchi!! I used to be at Mulungushi regularly for meetings. Mulungushi could only host 5,000 people. We had no facility that could host more than 5,000 in Zambia. Now the President is aware about it but tribal people Ha Jealousy. That is why HH will NEVER be elected. Everything about Zambia, to them it is TRIBE first. These are the most tribal people there is on earth! God help them! LETS DEVELP ZAMBIA while he develops his Ranch to make dung. What positive thing is there to say when $30million is a loan…haven’t you read that the US govt will be contributing $300 million to fight AIDs in Zambia …you are talking about a conference centre used once a month…utter tommyrot thinking!! FYI …I look at bill of quantities for historic listed buildings here done using state lottery funding …they dont cost £30 million …a face-lift should never cost that much you are better off simply demolishing and building a new one for such a figure…the only alternative is spend £3 million from GRZ purse forget the loan….why should every project via Chinese loan have zeros in it? I can envisage this being of similar design to that KKIA Chinese tiles and glass…outdated cheap designs. This the selfsame reason we are in debt …always spending loans on pointless things and consumption…yes lazy mindsets!!!!!!!!! It can’t be positive. MAD COW DISEASE first think “Tribe” before they think. Check who is carrying out the works, what they claim they will do and materials being used. Let’s develop this thing! It will NEVER be president! Maybe a section leader at Animo Farm in Namwala. Ba president please pay employees of museums in arts and tourism .